The route for the next race has been announced, and includes a traditional challenge: the Southern Ocean. Video published June 29, 2016, by VolvoOceanRace.com. The best monohull racing circuit in the world continues this week with the second 52SuperSeries regatta of the season--Audi Settimana Delle Bocche - 28th June–2nd July. Official Practice Race on Monday, June 27th. Audi Settimana delle Bocche › 52 SUPER SERIES - Pure Performance: Venue: Yacht Club Costa Smeralda - The Yacht Club Costa Smeralda has been synonymous with racing at the highest international level for decades and has been host to many world championship regattas as well as the Maxi Worlds. It is home to the Azzurra campaigns such as “challenged for the America’s Cup” and now runs the TP52 Audi Azzurra Sailing Team. The Costa Smeralda takes its names from the colour of the vivid turquoise waters but as well as the stunning backdrop of the north east of Sardinia, the winds are reliable and from a choice of different directions. The mistral winds from the north, levant winds from the east and scirocco winds from the dry lands of Africa all provide variety and excitement. The Yacht Club Costa Smeralda are well known for the Sardinia Cup international team event and in 2011 were hosts to the TP52 World Championships." Notice of Race - Eligibility: "3.1 The 2016 Audi Settimana delle Bocche is open to all boats with a valid 2016 TP52 Certificate, as well as IRC52 boats with a valid 2016 IRC Certificate and TP52 Class confirmed Wild Card invitation based on the limits of Appendix B. 3.2 All competitors shall comply with World Sailing Regulation 19 Eligibility Code." Your sailboat sails take it on the chin from wind, sea, salt and UV light rays. How can you save big money to add life to your costly boat sails throughout the season? Watch this sailing video for a simple sailing solution and visit http://www.skippertips.com for more sailing basics and boat safety tips from Captain John, who (with 25+ years of experience) shows you the no-nonsense cruising skills you need for safer sailing worldwide. The Inquisitr: Coast Guard Suspends Search For The Family Who Went Missing DuringSailing Trip In Florida: The Coast Guard, on Saturday, called off its search for the family that went missing during a sailing trip in the Gulf of Mexico nearly a week ago. Body being retrieved from abandoned yacht | Radio New Zealand News: "... Auckland boat builder Nick Saull was hit by rigging and killed when the Platino got into trouble in rough seas between Fiji and New Zealand on Monday. Another crew member - whom police have named as Devonport man Steve Forno, 63 - remains lost at sea, while three survivors were rescued by a container ship and are safely back in Auckland ..."
Lindsay Owen-Jones 100-ft Maxi Magic Carpet Cubed (GBR) claimed line honours at the 2016 Giraglia Rolex Cup. Crossing the finish line in Genoa at 15:02:56 CEST Thursday, Magic Carpet Cubed completed the offshore race from Saint-Tropez, France in 26 hours, 48 minutes and 56 seconds. The 2016 Giraglia Rolex Cup will be archived as one of the most challenging. Starting light with a tactically demanding middle, it ended with a flourish; at times an alarming one. For many yachts the final leg from the Giraglia to Genoa will last long in the memory, as a bruising south-westerly wind built rapidly to 30 plus knots and whipped up the seas. Lasting from late on Thursday night to Friday morning, this wind added serious gasoline to the efforts of the slower yachts to overhaul the fastest in the race for the corrected time, and overall, win. When Gilles Pages and the French crew of Tip crossed the finish in the early hours of Friday morning they moved to the top of the podium. On Saturday morning Tip was confirmed as the worthy winner of the 64th Giraglia Rolex Cup. Overview of Coast Guard mobile application for boating safety for smartphones. U.S. Coast Guard video published May 12, 2015. More info: http://www.uscg.mil/mobile/. As the nation's recreational boating safety coordinator, the Coast Guard works to minimize loss of life, personal injury, property damage, and environmental harm. The Coast Guard's boating safety program involves public education programs, regulation of boat design and construction, approval of boating safety equipment, and vessel safety checks for compliance with federal and state safety requirements. The Coast Guard mobile app supports these missions by providing the essential services and information most commonly requested by boaters. National Safe Boating Week, Coast Guard stresses importance of carrying life-saving emergency distress equipment: "... the Great Lakes Coast Guard is reminding boaters of the importance of carrying life-saving emergency distress equipment. While many boaters rely on cell phones for emergency communications on the water, personal locator beacons are much more reliable in the marine environment. The Coast Guard highly recommends all mariners equip their boats with Emergency Position Indicating Radio Beacons and/or their life jackets with Personal Locator Beacons. EPIRBs and PLBs may be activated manually by the push of a button or automatically when they enter the water, depending on the model. A PLB is a small battery-powered device that transmits a digital burst to a satellite once every 50 seconds, which the Coast Guard monitors. These devices have a shelf life of 6 to 8 years. PLBs send out a continuous signal for 48 hours unless turned off. New search-and rescue technology aboard Coast Guard Dolphin helicopters and 45-foot response boats can now hone in on the signal of a transmitting PLB. The 406Mhz PLB signals are coded, allowing non-PLB signals to be filtered out by the National Oceanic and Atmospheric Administration operated search and rescue satellite aided tracking. Coast Guard urges float plans: "The Coast Guard urges all boaters to file a float plan with family or friends during National Safe Boating Week and the boating season. A float plan, similar to a life jacket, is a life-saving device on paper, which can make a difference in rescue and response time in the event of an emergency. Before boaters embark, they should leave detailed information about their trip with a family member or friend who is staying ashore. Include all information that would help rescuers in case of emergency, such as how many people are aboard, where you are leaving from and returning to, your intended route, how long you will be out and a description of your boat. However, do not file float plans with the Coast Guard. A float plan is equally effective for the owner of a kayak or flat-bottom skiff as it is for a large cruiser, a 90-foot sport-fishing vessel or luxury yacht. Typically, the owner or master of the vessel is the individual who prepares the float plan; however, any member of the crew can be assigned the preparation and filing duty. To obtain a float plan form, click here for a downloadable form." Video published May 26, 2016 by US Sailing. Video published May 27, 2016, by US Sailing. The offshore race of the 64th Giraglia Rolex Cup got underway today at midday, with 268 yachts departing from Saint-Tropez for Genoa, via the Giraglia rock. Following three days of blissful warmth and generally clear skies, the Cote d’Azur went feral with a rain storm blanketing the bay of Saint Tropez just before the first gun. For the 2,500 or so competitors the ambient spirit may have been dampened, but these are sailors used to putting up with some hardship to pursue their passion. Poor weather is just one of those things to be expected and dealt with. From the start, Sir Lindsay Owen-Jones’ Magic Carpet Cubed visibly declared her size and power taking a firm lead on the short upwind leg to a mark off Saint-Tropez. Rounding the buoy, she hoisted her massive gennaker and proceeded to stretch her advantage over the chasing pack, which included the Maxi 72 Jethou owned by Sir Peter Ogden. Both Owen-Jones and Ogden are perennial competitors at the Giraglia Rolex Cup. “Doing this race is always a huge pleasure,” says Owen-Jones. “We spent a long time trying to win it overall, and to do so last year means a lot less pressure this time. We can enjoy it so much more, especially rounding the Giraglia which is a magical moment in the race.” Ogden is in accord with his compatriot’s view of the race: “I just love it. Rounding the rock is a mystical experience that I just never want to miss.” By 14.30 Magic Carpet Cubed and Jethou had confirmed their status as front-runners having passed the next mark of the course just off La Taillat. Heading to the Giraglia at about 10 knots they had successfully passed through the first of the wind transitions. 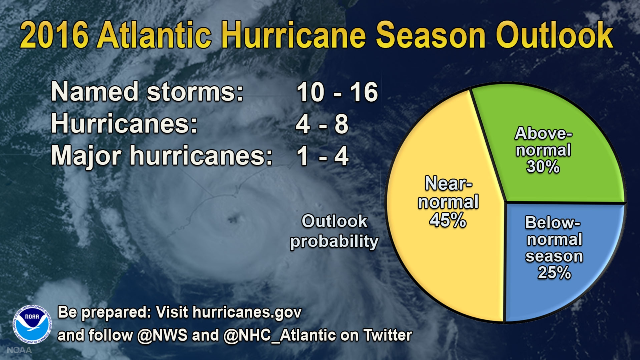 "NOAA’s Climate Prediction Center says the 2016 Atlantic hurricane season, which runs from June 1 through November 30, will most likely be near-normal, but forecast uncertainty in the climate signals that influence the formation of Atlantic storms make predicting this season particularly difficult. "NOAA predicts a 70 percent likelihood of 10 to 16 named storms (winds of 39 mph or higher), of which 4 to 8 could become hurricanes (winds of 74 mph or higher), including 1 to 4 major hurricanes (Category 3, 4 or 5; winds of 111 mph or higher). While a near-normal season is most likely with a 45 percent chance, there is also a 30 percent chance of an above-normal season and a 25 percent chance of a below-normal season. Included in today’s outlook is Hurricane Alex, a pre-season storm that formed over the far eastern Atlantic in January. “This is a more challenging hurricane season outlook than most because it’s difficult to determine whether there will be reinforcing or competing climate influences on tropical storm development,” said Gerry Bell, Ph.D., lead seasonal hurricane forecaster with NOAA’s Climate Prediction Center. "However, a near-normal prediction for this season suggests we could see more hurricane activity than we’ve seen in the last three years, which were below normal.” Read more here. Know your area and the evacuation routes. In Florida, they are available on the Florida Division of Emergency Management’s Website. See also: JohnTheCrowd | Sailing News: Artemis Racing, Road to Bermuda, SE2/EP3, Sailing Video: In Sweden, construction of the Artemis Racing's America's Cup Class Yacht has begun. Next year all six America’s Cup teams will race in the Louis Vuitton America’s Cup Qualifiers, in new America’s Cup Class foiling catamarans, purpose-built for the racing in 2017. Qualifiers are scheduled to take place on Bermuda’s Great Sound.. If the defending champion, ORACLE TEAM USA, wins the opening series, it will earn a one-point lead in the America’s Cup Match series. If the winning team is a challenger, and they end up in the Match, they will have the advantage on the scoreboard. Sailing: America's Cup comes to Chicago aiming to avoid mistakes made in New York | The Salt Lake Tribune: "If you had to bet on good conditions between New York in May and Chicago in June, Chicago would win hands down." --Ken Read, an NBC analyst and professional sailor. The challengers are competing for a chance to take on Oracle Team USA in the America's Cup finals, a match race scheduled for June 2017 on the Great Sound of Bermuda. An exclusive behind the scenes insight into what it takes to mount a challenge and compete in the 35th America's Cup. Follow Artemis Racing in 2016 as the team prepares to win the oldest and most prestigious trophy in international sport. Press Herald: First Atlantic Cup boat crosses finish line in Portland Harbor “As soon as I get around Cape Cod, I'm going to be all smiles, and it's pretty exciting for me to be finishing a sailing race in my home port,” Davis said. 7News - WSVN-TV: South Florida couple returns home after sailing the world A dream came full circle for a California couple, who arrived in South Florida after spending several years sailing around the world. Highlights from Extreme Sailing Series, Acts 1 and 2. The curtain was officially raised for the 2016 Extreme Sailing Series™ in March, kicking off the season in style in the Sultanate of Oman. The season started with a stunning coastal race down to the historic old town of Muscat, which saw the new hydro-foiling GC32s race against the backdrop of the Al Alam Royal Castle in the Muttrah Port on the opening day. The fleet then took to the Omani Stadium for three action-packed days of racing, which saw the eight teams really get to grips with flying. Muscat proved the perfect debut for the Extreme Sailing Series to ‘fly’ into its 10th season. From 29 April - 2 May the Extreme Sailing Series™ saw the fleet face the challenging, fickle conditions China threw at them for the second Act of the 2016 circuit in Qingdao. Take a look back at the Act highlights here. Published May 24, 2016.